The Indian Navy is currently without an aircraft carrier as its flagship INS Vikramaditya is undergoing maintenance. India’s new aircraft carrier INS Vikrant is unlikely to be ready before 2023. Russia is doing all it can to keep up with the Indian Navy’s changing designs. India wants two combat ready aircraft carriers available, on its east and west coasts, at any given time. Carrier construction, however, has not kept in step with this lofty ambition. The Cabinet Committee on Security gave approval for the construction of the Indigenous Aircraft Carrier (IAC) in May 1999, but the first of these two floating airfields, the INS Vikrant, is expected to be fully launch ready only in 2023. The Comptroller & Auditor General (CAG) of India’s report titled ‘Union Defence Services Navy and Coast Guard’ tabled on July 26, 2016, says the IAC programme has suffered delays because of drastic revisions right through the carrier’s timeline. Ship construction involves the following stages; production, keel laying, launch, outfitting, basin trials, contractor sea trials, and final machinery trials. Currently, the carrier is at the outfitting stage and the final bill is estimated at $3.76 billion. While the Defence Ministry and the Indian Navy insist the ship’s final delivery timeline is December 2018, the CAG report says the delivery of the carrier with completion of all activities is likely to be achieved only by 2023. The report also reveals the extent of Russia’s participation, showing that Moscow continues to be a key player in Indian defence projects of strategic importance. Russia’s primary role is in supplying equipment for the construction of the Aviation Facilities Complex. The AFC comprises one of the most critical areas of an aircraft carrier, and houses its aviation armament, stationary and mobile systems, devices and aggregates required for using the aircraft onboard the carrier. According to the CAG, AFC design was to be locked by December 2004, but was completed in January 2009. Therefore, procurement of 32 items of equipment could be initiated only in April 2009 as against the scheduled timeline of December 2006. Audit scrutiny of records of the Indian Navy and Cochin Shipyard Ltd (CSL), where the vessel is being built, showed that out of 14 non-Russian origin equipments, nine were ordered between May 2010 and October 2015, indicating that even eight years after scheduled timelines, the remaining equipment was yet to be ordered. Russian origin AFC equipment was ordered between January 2012 and November 2015, after conclusion of a General Contract – an umbrella contract for placing orders with Rosoboronexport (the defence export cartel) under separate supplementary agreements which are concluded for manufacture and delivery of AFC equipment. Signed in June 2011 between CSL and Rosoboronexport on a turnkey basis, it stipulates that the supplier would render technical assistance in the form of documentation, installation, trials and performance of the AFC equipment within 66months from the date on which the contract comes into effect. The general contract came into effect from August 1, 2012. “This indicated that procurement commenced nearly five years after scheduled timeline of December 2006,” says the CAG report. Critical equipment such as arresting gear, hydraulic stations and restraining gear were not delivered in time. 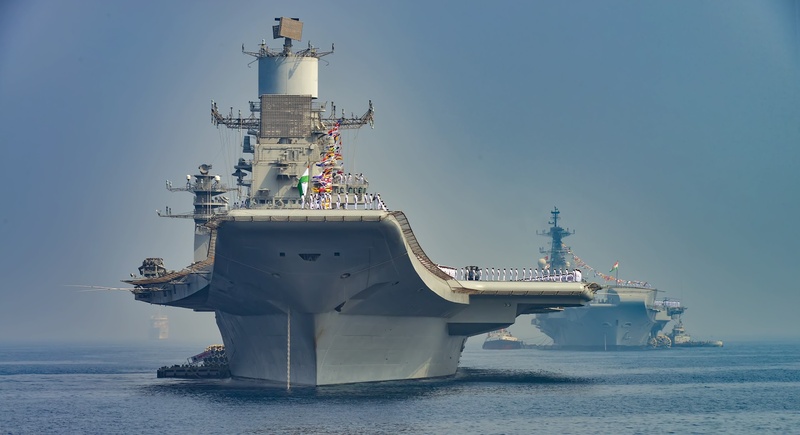 The 26th meeting of the Indo-Russian Inter Governmental Commission-Military Technical Cooperation, in August 2015, highlighted that the delay in delivery of the arresting gear and restraining gear was seriously impacting the carrier’s construction schedule. In response to the CAG audit query, the Directorate of Naval Design (DND) admitted the delay in delivery of ordered AFC equipment and delay in concluding contracts for the balance AFC equipment had affected the progress of construction. DND also said lack of design information on some of the ordered Russian equipment and unordered AFC equipment was precluding the completion of modelling of compartments above the carrier’s fourth deck, thereby impacting the outfitting of these compartments. Preliminary staff requirements (PSRs) indicate the role of the ship, its dimensions, specifications of its hull, major machinery, weapons, sensors, accommodation and manpower, endurance and fuel capacity and so on. PSRs are crucial as they lay down the benchmarks for the platform to be procured, based on which the platform is evaluated and its suitability determined for induction into the service. The concept design received from DCN of France in March 1990, based on the operational requirements of the Indian Navy, concluded that a ship of around 37,500 tons was required. However, for various reasons, the Navy considered a different tonnage for the ship and accordingly promulgated PSRs which were not in sync with a ship of 37,500 tons. This played havoc with deadlines. Another key area where things went wrong is General Arrangement or GA – the document based on which the ship is designed and constructed. The GA drawings principally represent volumes, spaces, compartments, bulkheads, hull forms, decks and main equipment. CSL claimed that the continuing changes had not permitted the yard to complete the design of the ship and was one of the major reasons for delay in design completion. While the Indian Navy contended that 1193 changes were proposed by CSL, the latter observed that modifications to GA document raised by them had been done to resolve/correct issues arising out of incorrect design in GA document prepared by the Indian Navy. Any modification to the GA document had a consequential effect on the detailed design and construction schedule of the carrier. As hull construction was complete and further changes had larger implications, in May 2015 CSL requested the Indian Navy to restrict any more changes in order to allow the yard to proceed unhindered with building the carrier. DND’s view was that the delays were unavoidable since design and construction of the carrier was being undertaken for the first time. What will the Indian Navy’s new carrier look like? However, according to the CAG, “The reply of the DND is not acceptable as the Indian side failed to provide the complete GA document and did not work in close coordination with the Russian counterparts to finalise the contract within scheduled timelines. In spite of the fact that design and construction of the ship was being undertaken for the first time, the Ministry, while seeking approval (October 2002) for construction of the ship, had scheduled the delivery in December 2010, which proved to be highly optimistic”. As per the Indian Navy’s PSRs submitted in August 2004, the maximum speed of the new carrier would be 28 knots while the cruising speed (the speed at which the vessel travels in the most fuel efficient manner along with other fleet ships) would be 18 knots. The ship would have 45-day logistics endurance and a range of 7500 nautical miles at 18 knots. The 37,500 ton ship would be designed to have a complement of 160 officers and 1400 sailors. However, Cochin Shipyards lacked the experience required to handle a project of such a massive scale. A technical audit of the shipyard carried out by DCN discovered the shipyard had “never built warships and was not used to the complexity of their designs, hull and systems”. To adapt CSL to produce an aircraft carrier, DCN prescribed basic proposals with respect to augmentation of the shipyard’s infrastructure, organisation and human resources, which included creation of a shipyard project management team and a liaison team. However, this was not done and the project management team remained a weak one. One of the reasons cited in the media for the delay in the carrier taking to the water was Russia’s inability to supply special steel. The CAG report agrees that “non-availability of steel was one of the major reasons which affected the progress of ship construction”. But supply of steel from Rosoboronexport did not materialise as CSL could not accept the Corporate Guarantee offered by the Russian company against the requirement of Bank Guarantee stipulated by the Reserve Bank of India. Consequently, in 2004, the Indian Navy decided to use indigenous steel which was the equivalent of Russian steel. The CAG report notes: “Despite the fact that Steel Authority of India Limited (SAIL) informed (May 2004) the Indian Navy that they could supply only steel plates, the Indian Navy intimated (July 2004) CSL that SAIL had confirmed their ability to supply all steel plates and sections (bulb bars) required. Accordingly, CSL placed (December 2004) a purchase order on SAIL for supply of steel plates and bulb bars. The supply of bulb bars from SAIL remained unsatisfactory, and CSL had to go back to the Russian supplier. The ensuing delay “severely affected production”. Another contributory factor in the launch delay was the drastic change requested in the heating ventilation and air-conditioning (HVAC) design by the Navyin 2010. On this, the audit report comments that changes to HVAC design impacted the design of 800 out of a total of 2300 ship compartments, which was likely to have a cascading impact on the design completed in the compartments. Having a plethora of foreign contractors involved in the project may also have contributed to the delays. In 2007 CSL placed a purchase order for gear boxes with Germany’s Renk, for delivery by 2009. However, it was observed during impact testing that some of this imported equipment failed. The Indian Navy is currently without an aircraft carrier as its flagship INS Vikramaditya is undergoing maintenance. Had the goalposts not shifted, the INS Vikrant would most likely have been flying the navy’s flag. India would have moved on to its next big project – the over 60,000 ton INS Vishal. Perhaps DND is right – delays are inevitable because this is India’s first aircraft carrier project. But at the same time, the Defence Ministry needs to find out if the delays are because of inexperience, bumbling or if someone is making money from the extended construction. It really shouldn’t take 24 years to construct a medium-sized aircraft carrier. After all, it takes the US only seven years to authorise, construct and deliver a 100,000 ton carrier with nuclear-propulsion.